We love fall in the lawn care world. Cooler temperatures and increased moisture make fall an ideal season for growth. Fall is also the perfect time to consider overseeding for your lawn. What exactly is overseeding? Overseeding is a tactic for thickening your lawn. It is the process of planting new grass to cover areas of your lawn that are looking bare or thin. The lawn may have suffered damage from hot, dry summer weather. The lawn may be in the early years of establishment. As grass matures, its reproductive capacity falls. The lawn may be suffering from Summer Patch, a disease that attacks the roots of the grass and causes areas of a lawn to turn brown. Are you experiencing any of these issues with your lawn this year? Late May through mid July was hot and dry for our area, so you may be noticing damaged spots on your lawn. Our area has also seen an increased amount of Summer Patch. Considering these problems, now is a good time to evaluate overseeding as a way to repair damage or thicken thin areas in your yard. It improves the thickness and appearance of your lawn. It increases your lawn’s ability to resist insects and disease. It allows your yard to fight off weeds more effectively. It gives an opportunity to introduce more disease resistant grass seeds. If the right kinds of grass seed are used, this can result in a stronger lawn. At this point, you may be thinking: overseeding sounds great! Why wasn’t I told about this option in the spring season when the new grass would have all year to grow? As it turns out, there are many advantages to overseeding in the fall or late summer as compared to attempting it in the spring or early summer months. Balanced temperatures help growth. Fall is warm enough to allow seeds to germinate, allowing the grass to experience a strong start. At the same time, it is cool enough to allow for good growth once seeds have germinated. Grass has a chance to grow before the cold winter months hit. The grass will also have time to grow deeper roots during the following spring before dry summer heat. Baby grass is given a safe start since there will likely be fewer weeds trying to choke new growth during this time of year. An effective overseeding process is simple. First mow low to the ground and bag grass clippings (the seed needs to contact soil). Aeration is sometimes used to increase seed to soil contact. Next, spread the grass seed. Once the seed is down, proper watering and fertilization are the best ways to give the new grass a quick start. We can help assess the best blends of proven, high-quality grass types for your specific lawn. If you choose to seed your lawn yourself, let your lawn care company know so that germinating seed is not harmed by other lawn treatments. We hope this knowledge is helpful to you. If you would like to discuss overseeding on your lawn, call us at 260-489-2500, contact us via our website at crownandblade.com, or simply reply to this post. I have some perennial ryegrass that I have in some areas in the backyard. I wonder if it would be beneficial to overseed with better bluegrass or other seed? 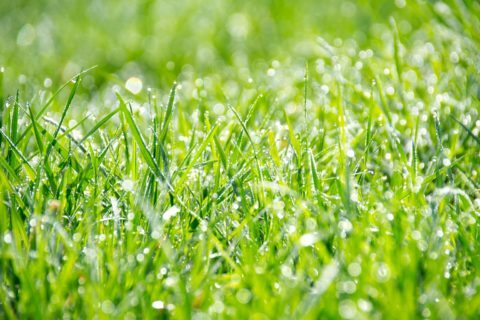 Because you have irrigation, we’d recommend overseeding with Kentucky Bluegrass. KBG grows in rhizomes which can overtake the perennial rye grass without a problem. Would you like us to contact you with a quote on overseeding? Can I still overseed now? I believe we had a conversation on this after your comment was written, but if you still have questions please email customerservice@crownandblade.com. Have a wonderful week!